I am copying and pasting a bit from the Greenlee website (and in doing so, spotted a typo, "...throught it with Greenlee") to let you know about a little counter promo we are running "while supplies last." 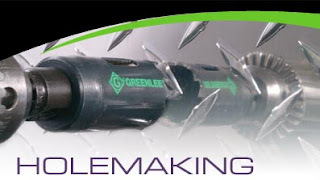 When it comes to innovative tools, Greenlee delivers year-after-year with a comprehensive line of holemaking products that is second to none. Their tools get through steel, stainless steel, wood, aluminum, fiberglass, plastic, drywall, ceiling tile, cement board and more. If you need to knockout, drive, drill, cut or punch, you know you’ll get through it with Greenlee.